The world’s oldest profession gets a showcase of its own at last in rock ‘n’ roll and it should come as no wonder that the person singing about it, not to mention partaking in its services, is none other than Wynonie Harris. 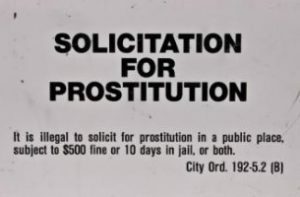 I suppose the only thing we can be shocked about is the admission that Wynonie, who never missed a chance to remind one and all that he was an irresistible ladies man, is not averse to paying for his needs to be met every once in awhile. In every other way though Harris is his usual irrepressible self… just the way we like him. Wynonie Harris was in the best position he’d been in for quite awhile… though I suppose I should add “commercially” so nobody gets the wrong mental image of “best position” considering the topic of this particular song. The up and down career he’d enjoyed to date, beginning with a chart topping single when fronting Lucky Millinder’s band in the mid-1940’s which then saw him set out on his own with high expectations but gradually diminishing returns until he seemed just about washed up by mid-1947, was on the upswing again. Rock ‘n’ roll, a brand of music made to order for the no holds barred vocalist, had rescued him from increasing irrelevancy by the winter of 1948 and placed him at the forefront of the style. Yet even that road back to glory wasn’t without its potholes as he – more than most – was negatively impacted by the recording ban as King Records refused to bring him back into the studio in violation of the musician’s strike to follow up his two big rock hits (which emptied out their stockpile of his pure rockers) even as his competitors were releasing new (illegally recorded) material they used to promptly catch and pass him along the way. Once the ban was lifted in December 1948 Harris jumped back into the fray but there had to be concern that the boat might’ve sailed while he was sleeping on shore that past year. It could at least be reasonably argued that his hits of the previous year may have been a case of perfect timing as he’d taken already existing material – by rock’s visionary founder Roy Brown no less – which had been slightly under-cooked in its original form thanks to an ill-suited backing band that Roy had nothing to do with, and simply heated it up with an all-star horn section and the addition of a more prominent backbeat which gave Wynonie a leg up that he took advantage of, connecting with an audience longing for such music without much in the way of options as of yet. Those elements he injected were crucial additions to be sure, but now that others had learned the formula he’d unwittingly tapped into and had adapted it themselves, refining it in some cases and even improving upon it with newly written original material designed to highlight it even more, what guarantee was there that Harris would be able to catch up again? Now of course Harris’s momentum had been derailed numerous times in the past either due to substandard material, weak arrangements or a lack of variance in his own deliveries and he’d managed to recover from those afflictions time and again. He made more comebacks over the years than Lazarus, Rocky Balboa and the popularity of male facial hair, but surely someone with his predilection for the high life wasn’t indestructible. Since his most recent reasons for getting sidetracked had little to do with his output, but rather this time it was that LACK of output of new material thanks to the aforementioned year off between recording sessions, he was in another boat entirely for a change, one he might be less able… less willing… to climb out of. 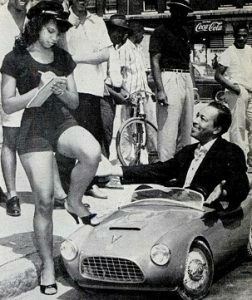 During this past year Wynonie Harris was having praise heaped upon him left and right for those aforementioned hit records of his that came out over that time and you can bet that as he was riding high on the charts he was also soaking in the adulation it brought him (and NOBODY enjoyed acclaim more than the egotistical Harris). All of that meant that there was every chance he may have taken his renewed status as his just due and felt he didn’t need to work hard to keep it going. But once he was back in the studio those fears proved unfounded as somebody involved had been paying attention to the marketplace and taking notes, for the material he tackled was unambiguous in its attempts at placing him back in front of the rock ‘n’ roll motorcade with songs designed to highlight the romping sounds that had defined it to date, as well to take advantage of Harris’s own reputation as a perpetually risqué hell-raiser. It worked too, as both sides of his first single after he emerged from hibernation had hit the charts, the somewhat limited but raucous sounding Grandma Plays The Numbers and the far more subtle charms of I Feel That Old Age Coming On, showing that Harris wasn’t destined to be left behind now that the entire industry was churning forward again. So their feet back under them, his reputation restored and expectations now higher than ever, Harris was faced with living up to those expectations each and every time out, something which presented more than a few problems for somebody as unpredictable as he. One of the advantages to having a singer whose real life reputation was so colorful and surprisingly well-known throughout the black community in the days before celebrity outlets like TMZ and gossipy entertainment rags was the fact you had a ready-made image with which to exploit in song. In Harris’s case that meant the following topics – drink, dames and debauchery – came without the need for much explanatory set-ups. Just throw Wynonie in the middle of whatever den of inequity the lyrics are describing and the listener will be convinced from the first word that Harris not only was intimately familiar with the surroundings but very possibly drew the floor plans for the place… or at the very least knew all of the backdoors out of the joint to escape unscathed when the law arrived to shut it down. But that intimate knowledge of such ribald themes also could be a hindrance to actually crafting a well-plotted story which could stand on its own as a composition without the need for Harris to act as the living breathing advertisement for its off-color contents in order to sell it. They’d faced this issue on the aforementioned Grandma Plays The Numbers which contained all of its supposed titillating value in the title of the song without any colorful details or anecdotes to flesh it out. Though presented in his typically full-throated lusty roar which made it sound invigorating on first listen, the song got thinner and thinner the more you studied it. That hadn’t made much difference commercially, maybe because audiences were either so starved for new Harris material or because they were simply caught up in the excitement his voice projected that they hadn’t noticed it lacking in other ways, but that was hardly the means with which to ensure long term viability. This was especially the case when other top stars – from Roy Brown to Amos Milburn – were serving up deeper storylines with no let up in the musical side of the equation either. She Just Won’t Sell No More flirts with a lack of depth in the writing department on the surface, as if everyone involved went into the project thinking the mere situation will be plenty for Harris (and his fans) to get off on. But while the idea itself may not have given them much to work with beyond the topic itself, none of the participants simply mailed it in and as such it gave the ravenous Harris just enough meat to gnaw on and get some sustenance out of the record. The rundown, in case you are of the church-going variety who feels even holding hands before being engaged is a sin, is that Harris finds himself rather horny. What a shock, I know. Apparently he’s defiled all of the available single women in town and either their fathers are on sentry duty and heavily armed in an effort to keep him away from their daughters, or else the ladies are all in the maternity ward ready to deliver the results of those earlier trysts with him and so poor lonely Wynonie is left to look elsewhere for sexual relief. Meanwhile down the road it would appear that the proprietor of a stationary store has found that the greeting card industry is not quite as lucrative as its reputation would suggest and so, to pay the rent and make sure dear old mother doesn’t live out her final days destitute in a convalescent home, the young lady who runs the store has begun selling something not stocked on shelves or advertised in the window. Well when my pen runs dry, she sells me ink for a dime! Hard though it is to read between the lines let me be the first to inform you that his pen is missing two letters. I got what you want but I can’t sell no more! You get the picture and if not you’ll just have to wait until after your wedding night to find out. But that’s the problem, the scenario is SO blatant that there’s no sense of mystery, no unexpected surprises waiting in the next line to get a rise out of you. You’re left to hope the lines themselves are at least witty enough to retain their mild appeal by the third and fourth listen. I hate to break the news to you but they really aren’t, not by themselves anyway. In fact, I’d like to hear more about the sale on erasers or paper clips they’re running because it’d likely be a lot more informative – and quite possibly even more titillating – than much of this. The sad thing of course is they had plenty of options at their disposal if they really wanted to go for broke. I can think of quite a few lines about the envelopes she’s hawking that might be worth the time, and there’s always plenty of cracks that can be made about licking stamps or the long lines at the checkout counter he has to face when he wants to buy his umm… office supplies… from her. Ironically for a song entitled She Just Won’t Sell No More they all wind up selling the song a little short. But luckily Harris is more than game to sell us on the merchandise they DO have in stock and though mere suggestiveness will have to suffice he’s more than up to that task, shading each line with the awareness of somebody who’s intimately familiar with this girl’s cash register so to speak. So yes, in spite of its drawbacks I suppose they do manage to… well, “ring up a sale” to coin a phrase… elevating the record beyond what the components deserved, just not quite as high as they were all counting on. Yet despite it not fulfilling our needs completely there’s still enough to recommend here, even though none of it works as well as it clearly might’ve have with just some tightening up. The music, again courtesy of Joe Morris and his stellar crew as on the flip side, romps and stomps all over the track, a little shambolic at times but with the appropriate energy, a decent backbeat and some particularly explicit horn squawks designed to replicate her screams… (of dismay when her store is closed that is, which surely will be the officially sanctioned version of events the morality police will claim when writing this up). That accounts for the most daring and creative moment musically, even if the results are a little forced and almost awkward sounding unless you’ve been suitably warned beforehand. Meanwhile the others, including Johnny Griffith’s suggestive honking, replicate the desired mood of this type of scenario as the piano carries the rhythm along with well highlighted drum fills, all of which leave you reasonably satisfied but like most instances when you have to pay for the privilege of seeking pleasure you’re left with an empty feeling after the fact. King Records sort of hedged their bets with this release as well, marking She Just Won’t Sell No More as the A-side but also indicating the flip, Drinkin’ Wine Spo-Dee-O-Dee, as the double A side, in an attempt to signal to distributors, radio programmers and jukebox operators that both songs were potent enough to be the plug side, but really meaning that they were unsure which had more than passing appeal and were hoping the decision was made for them. It was, as the cover of Drinkin’ Wine… became the hit and this became little more than a long forgotten entry in Wynonie Harris’s never ending tour of carnal entanglements. Though I’ll go on record as saying I’m opposed to the thought of payment for such activities, since both Harris and the girl in question seemed to be okay with the idea of him providing financial remuneration for her generous offering of letting him use her ink well to dip his pen in, and since they themselves went on record (literally) to endorse such activities, I can’t criticize this on any moral grounds. However it falls short of what it might’ve been on musical grounds even though a trip with Wynonie to this girl’s store still beats an afternoon feeding pigeons in the park. 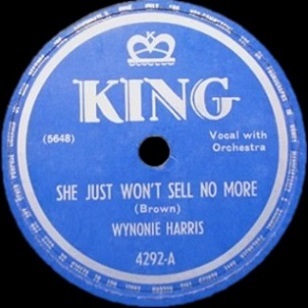 Leave a reply on "Wynonie Harris: “She Just Won’t Sell No More”"